A visit to the International UFO Museum at Roswell, N.M., would lead one to believe that the alleged crash of a UFO near that city in July 1947 was a true extraterrestrial event. At least six alternating videos and numerous displays and audio tapes explore testimony from eyewitnesses and strong circumstantial evidence of an alien crash, recovery and its cover-up by higher military authorities. Several of the pilots at the Roswell Army Air Base at the time state on tape that within a few days of the incident they flew wreckage to Fort Worth Army Air Field, to Washington, D.C., and to Wright Field (Dayton, Ohio). Three flights were also made to Los Alamos, N.M. Of course these unscheduled flights said to be hauling crash debris do not prove that an extraterrestrial vehicle was recovered or covered up at Roswell. What the flights prove is that the crash was taken seriously by the Base commander at Roswell and his intelligence and air staffs at the local level. 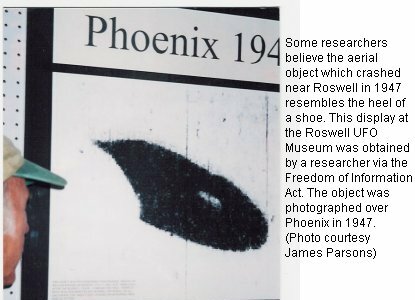 Comes now a story out of Roswell and Los Alamos which may explain the three flights made from Roswell Army Air Field to Los Alamos on July 9, 1947, a few days after the crash. This story is from Carol Syska, former director of the UFO Museum at Roswell during 1999 and most of 2000. Carol was a group secretary and division budget director at Los Alamos for almost 30 years. She retired in 1988 and moved to Roswell, N.M., not far from the town where she was born and raised. Carol first heard of UFOs when living in California in the early 1950s, resulting in an interest in UFOs in general. One day at Los Alamos, she read that a report containing information about UFOs was available in the Lab library. This sounded interesting to Carol. She ordered the report. She read this booklet, titled Project Blue Book, which contained some comments about wreckage from a crashed vehicle being sent for testing to Los Alamos. At the time (1962), Carol worked at the Lab with the NonDestructive Test Group (NDT). Her boss, a senior scientist, was head of NDT and had been with the Lab since the beginning of the Manhattan Project. If testing had been done on crash debris, Carol’s boss would know about the tests and the truth of the crash at Roswell. Carol went to the man’s office and showed the report to him. She asked, "Is this true?" Carol’s boss, in a business-like manner, replied, "What is the level of your security clearance?" Carol’s boss, after a pause, said, "Well, do you have the need to know?" Carol said, "Guess not," and moved to the door. Carol’s boss said, "Just a minute." After another pause, he added, "I would advise you to read everything you ever see about this subject." That was the end of the conversation. Carol never discussed the matter again with her supervisor, the senior scientist, who is now deceased. But Carol believes the scientist gave her a hint of the truth. Carol’s story continues. One afternoon in the early 1980s, Carol was in a car pool with three men going home, when one of them pointed to a bright light in the sky at about a 45-degree angle above the horizon. The sun had already set behind the mountains. "We all looked at the light, which wasn’t moving. All of a sudden, it dropped about 20 degrees and made a right-angle turn to the east and was gone in the blink of an eye. One fellow remarked, ‘I just got out of the Air Force three months ago, and we don’t have anything like that!’ We never told anyone about this incident," Carol commented. "We did not want to be made fun of." After retirement from the Lab, Carol joined the staff of the Roswell UFO Museum. Upon Carol’s first visit to the UFO Museum, she saw a letter from the Secretary of the Air Force stating that at no time had the Roswell incident been mentioned in Project Blue Book. This letter proved to Carol that a government cover-up was taking place. Carol continued to read denials of a cover-up as the years went by. One day, during the summer of 1998, a lady visiting the UFO Museum from Ohio told Carol that she had always wanted to visit Roswell since reading of the UFO crash years before. Knowing that the Roswell Incident was not public knowledge until the 1980s, Carol asked the lady what she had read that told her of the crash. The lady replied that she had read about the crash while working at Wright-Patterson Air Force Base (formerly Wright Field) in the early ’60s. Carol asked the lady what she had ready. The lady replied, "It was in Project Blue Book, the very earliest edition." This conversation between Carol and the lady from Ohio confirmed Carol’s belief in a government cover-up about the Roswell Incident. Why? Because the Incident was inexplicably removed from subsequent editions of Blue Book. Carol’s story raises serious questions for students of UFOs and the Roswell Incident. Researchers have long believed that Los Alamos may have played a greater role in the Incident than is presently understood. 1. Why would military leaders send a pile of weather balloon parts, radar targets and American-made crash dummies for testing to one of the most sophisticated laboratories in the world for evaluation? 2. Why would it require a Q clearance to review these tests plus a need to know, if only weather balloon parts were sent to the Lab? 3. What was the true purpose of the three flights made from Roswell Army Air Field to Los Alamos on July 9, 1947? 4. Were later editions of Project Blue Book altered to conceal the fact that crash wreckage was sent from Roswell to the Lab? 5. And, finally, the ultimate question: Did an alien space craft crash near Roswell in 1947, and was it fabricated on another planet, and was the event kept secret from the public ever since? As I’ve suggested, a visit to the UFO Museum at Roswell could be an unforgettable experience for those with eyes to see and ears to hear. The museum is open seven days a week, and admission is free. James Parsons was an Air Force navigator in the 1950s. He is an art appraiser in Taos, N.M., and a member of two UFO study groups.